Eyes Wide Open | a forum for conversations about books, music, movies, and issues raised in the arts, media, and culture . . . with a spiritual slant! Yes, after turning fifty I am the newest member of AARP. That’s okay. You go ahead and laugh while I enjoy the benefits. I think I first realized how cool this organization was when I read a copy of AARP The Magazine at my chiropractor’s office. It had the best articles! 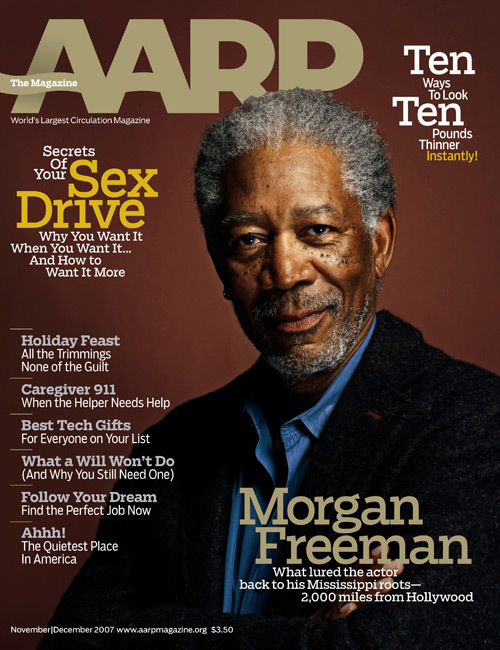 My favorite actor on the cover. Now that I am a member I get the AARP email newsletters that are equally as informative and interesting. Who would have thought I would enjoy reading junk email? Well, today I got an interesting email and decided to check it out. Click on the link below, and tell me if this isn’t the coolest thing you’ve seen in a long time! I have been hoping for a better presidential candidate for quite some time now. Who knew it would be me? Look for me on your ballot. AARP is one of my sponsors! NASHVILLE, TN (Press Release) – God’s calendar is not our calendar. According to Dottie Rambo’s calendar, this summer was to be her busiest in years. In the early morning hours of Sunday, May 11, God changed Dottie’s schedule. He wanted her in Heaven this summer and every day thereafter. Today, Monday, May 19 at 1 p.m. CST, hundreds of family members and fans gathered at Christ Church in Nashville, Tenn., to celebrate the life, lyrics and legacy of one of gospel music’s greatest songwriters. Here is a brief look at today’s service. Larry Dalton played many of Dottie’s hits on the piano as the fans and friends filled the church. By the start of the service, there was standing room only. Opening remarks were given by Dottie’s son-in-law, Dony McGuire. He opened with thoughts from the heart and scripture reading. There was a time of prayer lead by Rev. Charles Green. Dottie’s obituary was read by Bishop Jim Swilley. The Homecoming Choir started with Jeff Easter’s lone harmonica playing “Sheltered in the Arms of God.” The choir then joined in, with Ben Speer singing the solo. “Remind Me Dear Lord” was sung the choir with Terry Blackwood singing the solos. Jeanne Johnson did a great job on “If That Isn’t Love.” As the Homecoming Choir was seated, the Voices of Lee remained standing to sing “He Looked Beyond My Fault.” Babbie Mason and Jessy Dixon tore the roof off of Christ Church singing “I Go to the Rock.” The crowd sang along with reprise, after reprise, after reprise. “Mama’s Teaching Angels How to Sing,” was simply unbelievable. The Isaacs brought that Rambo family harmony back to life once more. Pastor L.H. Hardwick, Jr., shared the 23rd Psalm. A video tribute was next. 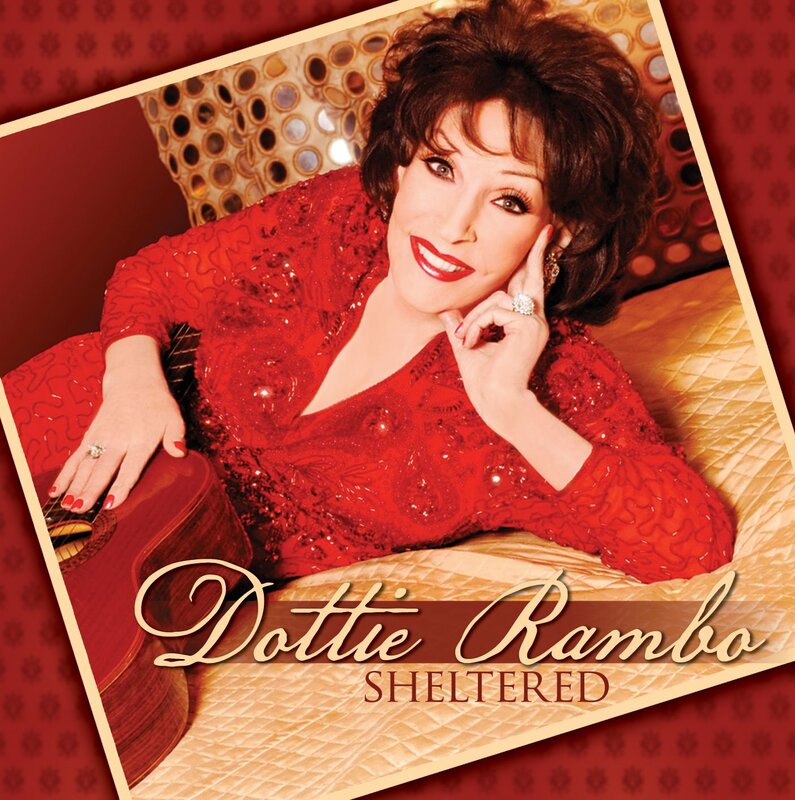 It included Dottie singing some of her biggest compositions, interviews as well as at home footage of Buck, Dottie and Reba rehearsing. Again, a special moment. The Greenes sang, “We’ve Weathered Storms Before,” a song the group released to Southern Gospel radio several months ago. Michael Langston read a letter from Temple Bailey about special mothers. Christian Ferguson, son of Dottie’s manager Larry Ferguson, sang “Stand by the River.” This was the song he sang with Dottie every night. Bishop Carlton Pearson read letters sent by Lily Tomlin, Rev. T.D. Jakes and President George W. Bush. President Bush sent a flag that was flown over the White House this past Mother’s Day as a special keepsake for Reba. Gloria Gaither recited a poem she had written, using many of the lyrics penned by Dottie. The Gaither Homecoming Choir included Bill and Gloria Gaither, Mark Lowry, Dino Kartsonakis, Johnny Minick, Crabb Family, Greater Vision, Hoppers, Isaacs, Booth Brothers, Scott Fowler, Hemphills, Jeff and Sheri Easter, Whites, Oak Ridge Boys, Three Bridges, Nelons, Monument Qt., Jim Murray, Michael and Tanya Goodman-Sykes, Lou Hildreth, Bob and Jeanne Johnson, Mike and Kelly Bowling, Phil Cross, Mitchel Jon, Dave McVay, Eva Mae LeFevre, Russ Taff, Jessy Dixon, Tank Tankett, Judy Nelon, Naomi Sego, Kenny Bishop, Naomi Sego, Ben Speer, Allison Durham-Speer, Ann Downing, Amy Templeton, Kevin Williams, Aaron Minick, Terry Blackwood, Rick Goodman, Lulu Roman, Ivan Parker, Karen Harding, David Phelps, Joe Moscheo, Bill Baize, Joel Key, Ann Downing, Henry and Hazel Slaughter, Reggie Smith, Nora Allen and many others. In addition to Dottie’s family and the Homecoming Choir, there were many artists and industry executives in attendance including Andrae Crouch, the Perrys, Lari Goss (producer/arranger), RW Blackwood, Billy Blackwood, Kevin McManus (Oak Valley Studios), Larry Strickland (Palmetto State Qt. ), Ed Harper (Harper Agency), Misty Freeman, Linda Davis, Debbie Robbins, Jeff Templeton (Templeton Tours), Bill Bailey (promoter) and many others. Dottie Rambo, unparalleled singer-songwriter, woman of God, and one of my personal heroes, went to be with Jesus early this Mothers Day morning. One of my longtime friends and personal friend of the Rambos called me this morning to tell me the news. As I write, I am still in shock. I knew I needed to hear some Rambo music immediately, so I put on The Rambos’ Greatest Hits CD while I was getting ready. 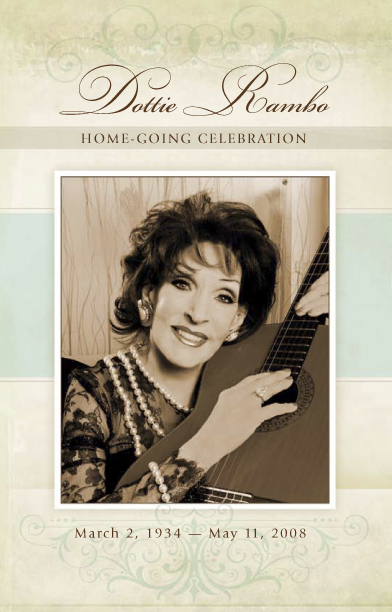 The music was Dottie’s testimony, and it gave honor to her Lord. Virtually every song in the track listing proclaimed a message that is as timely and applicable today as it was the day she penned the anointed lyrics and sang the lovely melodies: We Shall Behold Him, I’ve Never Been This Homesick Before, The Holy Hills of Heaven Call Me, He Looked Beyond My Fault and Saw My Need, Tears Will Never Stain the Streets of that City, I Call Him Lord, New Shoes, Build My Mansion Next Door to Jesus, Remind Me Dear Lord, and Behold the Lamb. I got my first Singing Rambos album when I was eleven years old, and I turn fifty this year. So you see how long these great songs have been a part of my life. Dottie wrote songs about mountains and valleys and Mama, but more than anything she wrote songs about Jesus. Dottie, we love you and miss you! But you fulfilled God’s call on your life and left a great legacy in song that will continue to minister to millions for years to come. The Yearling is a Hollywood classic and an adaptation of one of my favorite novels by Marjorie Kinnan Rawlings. It is the story of a 19th century pioneer family and their struggles to survive in the undeveloped Florida scrub. I remember being so excited when the movie was finally released on DVD several years ago, and then the confusion I felt when I saw the cover graphics. It makes me wonder . . . .
What genius at Warner Brothers designed the cover? Has the graphic artist actually seen the movie? When did God move the Grand Tetons to Florida? I don’t know about you, but my summer vacation plans are set, now that the Rockies are so close to my home in the Sunshine State. 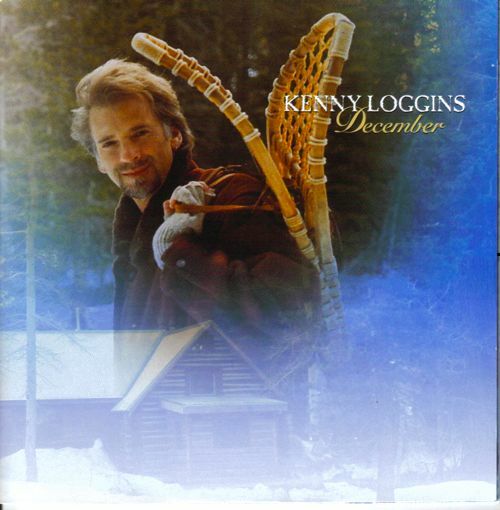 Kenny Loggins: December is without question my favorite Christmas recording ever. In fact, it may very well be my favorite project of any genre. These are bold words, I know, but I mean them. This album touches me and moves me in a special way and, gospel music excluded, like no other music I can name. This is the first November in recent years that I did not head up to my cabin in the North Georgia mountains for Thanksgiving week, and I am missing what has become a tradition of sorts. When I take the I-575 exit north of Marietta on my way to the cabin, I slip this CD in my changer and the music sweeps me away through the gray mists and autumn chill to my mountain home. 1) Walking in the Air – You don’t have to actually be in the high country to experience a snowy windswept peak. Just close your eyes and let the opening strains of this ethereal melody carry you away. This song was written by Howard Blake and originally recorded for the lovely animated short film based on Raymond Briggs’ The Snowman. In the liner notes for this track, Loggins thanks Blake for writing an additional verse for this recording. 2) The Christmas Song (Chestnuts Roasting On An Open Fire) – A song that could be tiresome for the myriad of times it has been recorded, but not here. This holiday classic is a welcomed addition rather than an overdone old “chestnut,” sung here in Kenny’s inimitable tender, expressive vocals. 3) The Bells of Christmas – The first of Kenny’s four original tunes on this recording tells a bittersweet seasonal love story. I love the opening oboe and later the strings. The story reminds me of a Christmas novel I read aloud to my class several years ago and would make an excellent theme for the soundtrack if the book were ever to be adapted for the screen. What Child is This? by Caroline B. Cooney resonates every time I hear the bells of Christmas. 4) Coventry Carol – A 16th Century English carol + Kenny Loggins + David Crosby and Graham Nash. The sum of this equation has the smooth, tight harmonies you would presume. 5) Christmas Time is Here – A gentle piano opens and a bluesy harmonica winds its way through this modern Vince Guaraldi classic from A Charlie Brown Christmas. 6) Angels in the Snow – The second Loggins original tune on this project may well be my favorite. The opening oboe line is a moving lead-in, and the wistful melody often brings me to tears, especially after it builds and flows with Mervyn Warren’s lush background vocals into the chorus. I wonder if I could write another verse for my Jamaican angel, and call it Angels in the Sand . . . .
7) White Christmas – A simple, clean, arrangement with a nice sax solo. This is Loggins’ tribute to his father. 8) Some Children See Him – What a great lyric! I remember this song from the Goodyear Christmas records of the 60s. Loggins’ tender vocals does the song justice. I like James Taylor’s rendition as well. TRO © (renewed 1982) and 1957 (renewed 1985) Hollis Music, Inc., New York, NY International Copyright Secured. All Rights Reserved. 9) On Christmas Morning – The third Loggins original song is yet another moving favorite. The chord progressions always takes me from “Christmas present” to “Christmas past” and remind me how we all should feel every Christmas morning with the one(s) we love. Michael McDonald does a great rendition of this song as well on his first Christmas project. 10) Have Yourself A Merry Little Christmas – Once again, Kenny takes a beloved holiday classic and makes it even more endearing than it was before. For many of us, the holidays are the most emotionally bitter-sweet time of the year, fluctuating from the highs of reunions and the rekindling of fond memories, to the lows of alienation and loneliness. At first glance, too often we’re fooled by the constant Christmas public relations into thinking everyone is having a wonderful time but us, a feeling as if we’re on the outside looking in. This fourth and final original song is a fitting end to not just another holiday project, but rather the experience that is . 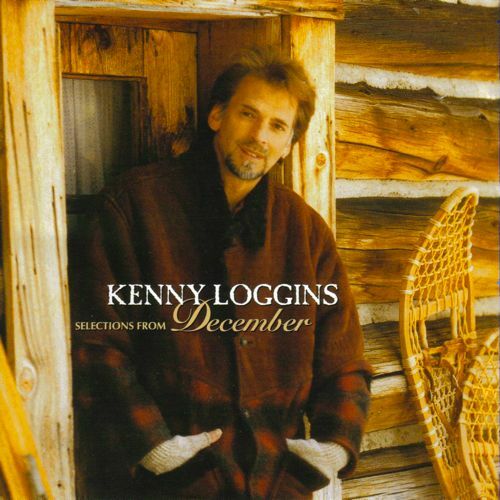 . . Kenny Loggins: December. The truth is, December is not your typical Christmas project from a mainstream artist. There is no Rudolph, or Frosty, or Santa, and thankfully not another recycled rendition of Mary, Did You Know. Like a stark, gray winter’s day, there is a trace of sadness that flows through the music as one track transitions into the next, but honestly, isn’t that the true bittersweet paradox of Christmas? I invite you to enjoy my favorite Christmas CD. Plant City Starbucks Opens . . . Finally! Got up this morning and headed to the brand-spanking new Plant City Starbucks located right off I-4 at the Thonotosassa Road exit. We’ve been waiting and waiting and waiting forever, and it finally happened. My first order was a grande Pumpkin Spice latte. Mmm-mmm-mmm! Note of Interest: We’ve already set a record. Plant City Starbucks has the highest sign of any Starbucks in the United States. I apologize in advance. This is a LONG, yet hopefully entertaining and informative rant, I mean post. As a public school teacher I knew I would eventually be posting my opinions on the myriad of issues affecting public education. I just thought it would be later, definitely not so soon. But it can no longer wait. Yesterday, teachers all over Hillsborough County, Florida, instead of teaching their classes were on their classroom computers madly checking their bank accounts and online school district pay advices to see if they were recipients of MAP (Merit Award Program), Florida’s newest brilliant plan for awarding merit pay only to the best and brightest teachers in the state. This brilliant plan became law when our all-powerful, all-knowing, wise and wonderful legislature replaced their previous 6-month old merit pay plan called STAR (Special Teachers Are Rewarded). Of course not a single “special teacher” was ever “rewarded” because that “law” never got off the ground. This newest merit pay plan is not rewarding all excellent teachers either. There is no way it could be fairly and equitably applied to all teachers in the state with so many Florida school districts electing not to participate. Imagine that. Your school board turns down money the state wants to give to you. And they do it all for you. With all its many bad decisions (Have you heard about the catfights at the Hillsborough School Board meetings? I’m rolling! ), at least Hillsborough had enough sense to take the money. The Florida Legislature has a stellar record with a string of “brilliant” teacher merit pay plans gone awry over the years. I’m not even sure I know them all, but I know the ones that have burned me. I was one of those teachers sitting at my computer yesterday frantically visiting my online banking and school district sites. You mean you were surfing the net instead of teaching your class, Howard? There is not much that can tear me away from my students. They are the best part of my school day. I thrive on teaching. I find joy in my kids faces every day. I’m not some sappy, idealistic, warm fuzzy schoolmarm; anyone who knows me would second that motion! I just love being a teacher, and I passionately teach what I believe is important to the best of my ability every single day. Not because a clipboard-in-hand administrator is conducting a “walk-through” (yes, that’s the current politically correct terminology for an informal observation) or because our former governor and cutting-edge educational reformist Jeb Bush is waving his almighty infallible FCAT test, or because a legislator or school board member is dangling a bonus award check over my head. I teach to the best of my ability because that’s who I am and what I do! So I was at my computer instead of teaching my class. Not to worry. My students were doing SSR (Sustained Silent Reading), one of the few educational acronyms that actually has its merits. You see, for Florida teachers it has been a looong summer with NO paycheck . . . WAIT! I stand corrected. There was that 1-day paycheck (brilliant idea) we got for reporting for the first day of teacher pre-planning on a Friday (another brilliant idea). . . because the Florida Legislature (again) passed a law that school districts could not start school any earlier than two weeks before Labor Day. They passed this law under pressure from vocal grassroots lobbyists and parents who said it conflicted with their vacations. I have learned over the years that public educational reform, especially in Florida, always results from either political agendas or grassroots efforts. Never from TEACHERS and other EDUCATORS who know a LOT about KIDS and EDUCATION, but rather from governors, legislators, school board members, administrators, supervisors, and assorted bureaucrats and nebulous nameless faceless committees who NEVER step foot in a classroom and DON’T have educational degrees and certification, yet they pontificate their amazing ideas and dump their statutes and rulings and behind-closed-doors decisions on principals, who in turn dump them on teachers who are forced to dump them on kids. You know the trickle-down effect. Of course as teachers we have no political clout. Our hands are tied and the DOE has our proverbial backsides in a sling. Our local teachers union, HCTA (Hillsborough Classroom Teachers Association), has very little bargaining power. The 10% raise teachers got last year was the superintendent’s idea. Contractual bargaining is done in back rooms behind closed doors and then presented to teachers for ratification at the beginning of the school year. Even apparent gains for teachers are always offset by stupid (yes, I used the “S” word) pointless additional requirements for teachers. This year negotiations added twenty minutes to the school day and required high school teachers to teach an extra period, time deducted from their already minimal planning time. Why? Last year my own school converted from a 7-period day to a 6-period day, requiring all teachers to teach an additional forty minutes every day which meant forty less minutes of planning every day. Why? A few years back, the school board added five days to the school calendar. Why? I say the answer to those “whys” is that the legislature and local school board want to squeeze teachers dry. They can’t bear the thought of treating teachers as valued commodities, or paying teachers at the level of any degreed professional in the secular world, nor can they understand the concept of attracting talented people to the profession with great benefits and generous salary package. They couldn’t care less what teachers think. They tighten the screw every year with added testing and documentation, an ever-increasing work load, and budget cut threats. All this from a state with both an “educational” lottery (that’s another story) and tourism sales tax revenues like no other. Yet the teacher shortage grows greater every year. I’m trying to stay focused, but as I write I keep being reminded of so many issues that I can’t help but mention. If this were a Florida Writes! expository essay (yes, the ones I teach) I would not earn a 6 for sure for lack of FOCUS. You teachers should go on strike! LAUGH OUT LOUD! Florida teachers can’t go on strike because it’s illegal for teachers to strike in the Sunshine State. Thanks, Jeb! Your legacy still haunts us. Okay. As I started to say several paragraphs back . . . I had a stack of unpaid bills sitting on my kitchen counter from going three months without a paycheck. So I needed that merit pay bonus BAD! You mean you don’t get paid year round? NO! Polk School District next door pays teachers once per month year round, but not Hillsborough. Now stop trying to distract me and lead me down another educational issue rabbit trail. The funny thing was that nobody knew yesterday who would be getting the MAP award. It was a BIG SECRET! Funnier still, some teachers didn’t know anything about it, even teachers who got the one-time payment, because you couldn’t apply for it. It was awarded based on a percentile derived from a mysterious formula based 40% on your annual evaluation (let’s hope your principal likes you) and 60% on your FCAT scores (lets hope you weren’t assigned the low group last year). Unless, of course, your subject area wasn’t tested, that is. Such is the case with teachers who teach science and social studies, two content areas not tested on the FCAT. Those teachers were awarded based on their students’ reading scores. You mean teachers were awarded merit pay based on scores in subject areas they didn’t even teach? So why the sour grapes, Howard? Because you didn’t get it? No, I got it. I’m just ticked because of my well-deserving, dedicated colleagues who didn’t get it. Like them, I’ve been a victim of unfair bonus payments in the past. During the 2000-2001 school year the “powers-that-be” had another brilliant plan . . . to give a bonus payment to science teachers. Science happened to be a teacher shortage area that year. Many sixth grade teachers are certified in elementary education, which means your principal can assign you to teach any subject area at your grade level. So, as a reading/language arts/geography teacher I was out of luck. I looked on as my equally certified colleagues got a bonus check and I didn’t. You could say I know how it feels to be left out. It’s demoralizing. It’s devaluing. It’s discrimination.! But there’s more to the story. Shortly after the bonus checks were distributed to the science teachers, I was walking down the sidewalk and happened to pass one of the science teachers on my team. He reached over and put five twenties in my hand. This teacher was already high on my list of great people, and with that single act he soared to the top. So are you going to give any of your bonus money away, Howard? Maybe. Even though I spent it all paying bills, I would be willing to pay it forward. If all the teachers could band together and find a way to distribute our bonuses equally with all the teachers who were overlooked, I would do it. 1) It all started for me in the late 1980s when I applied for the Florida Master Teacher program. A couple of my colleagues who had masters degrees had applied for it and earned it. Since I didn’t have a masters yet, I couldn’t apply. Then for some reason the legislature changed the rules, and I was able to apply. My principal conducted a formal observation in my classroom, I videotaped a lesson, and I took a subject area standardized test. Some time later I received notification that I had attained Master Teacher status, and I was awarded the annual merit pay bonus. Wooo Hooo! I had qualified as a master teacher and I would be receiving the bonus merit pay every year! That is until the Florida Legislature decided THE VERY NEXT YEAR to no longer fund the Master Teacher program. 2) Then there was the BEST (Better Educated Students and Teachers) Career Ladder program. This was former Florida Speaker of the House Johnnie Byrd’s baby. He’s from my hometown and I taught one of his daughters years ago. Again, I didn’t like the premise of singling out teachers, but it was legislated, so I took advantage of it and applied directly for a position as a Mentor, the highest rung in the ladder. Although the program did not get off the ground until midway through the school year (go figure) I compiled a professional portfolio, making sure to include copies of my published books, and interviewed with a school level committee. I was selected as one of four mentors in my school. We were sent to trainings in the summer. We were given agendas to present to the faculty, and our administrations had to schedule us for fewer classes to allow for mentoring periods. Oh yeah, and I was paid a half-year (since they started late) bonus check and everything was cool. I had been proclaimed a Mentor. Except that the legislature decided not to fund their own law the very next year. Burned again! Last I heard the BEST program was still law. You mean the Florida Legislature can pass a law then turn around and decide to not fund their own law? Apparently we have to honor and obey their laws, but they don’t have to. 3) Then I learned about National Board Certification for Teachers, a way for teachers to earn additional pay if they applied and earned certification first for jumping through all of the proverbial hoops of portfolios, videotapes, and final exam. When I attended the informational meeting, the first thing out of the presenters mouth was, “Of course there is no guarantee that NBCT will continue to be funded. That was all I needed to hear. Fool me once shame on you, fool me twice shame on ME! So I didn’t pursue the NBCT path and, . . . it has continued to be funded for many years now. So, with reluctance, I made application to do my National Boards this year. Help me keep my fingers crossed. 4) For the past two years I have made application for Performance Pay, another merit pay plan we have in Hillborough County. It has been in place for several years, and I had seen the box to check on my annual evaluations, but I didn’t know anything about it until my current principal encouraged us to make application even though it required more work for her. Apparently, our former principal had communicated the information in a faculty meeting (I must have been absent), but he never encouraged it. Application requires compiling (another) portfolio and getting an outstanding rating on our annual evaluation. Last year was the first year I received any money, and I have qualified for it this year, but no money yet. We shall see. Let me conclude this treatise by saying that I have always been vocal at the school level regarding these issues. Although I am not a troublemaker, anyone who knows me knows that unlike many teachers I run my mouth constantly, speak out openly, and share my views with anyone who will listen including administration, colleagues, parents, friends, and when appropriate, even students. Last time I checked this was America. We have First Amendment rights guaranteed by the Constitution and Bill of Rights, and that includes Freedom of Speech. Other than an unanswered letter to Jeb Bush, this is probably the first time I have put my views on educational issues in writing and published them in a public forum. But our rights also include Freedom of the Press. I used to say, “I tell it like it is,” until the “way it was” changed in my opinions. Now I just say, “I tell it like I see it.” Please feel free to respond to this posting by clicking the comments link below. Although all comments are moderated, I promise that all views presented (even those contrary to mine) will be posted unless of course they are rude or personal.